Finished, but not easy. You know that sometimes people tell me how clever they think I am when they learn that I have made something myself. Often it was really simple to make. But this set….. this is quite clever! Here’s the story. 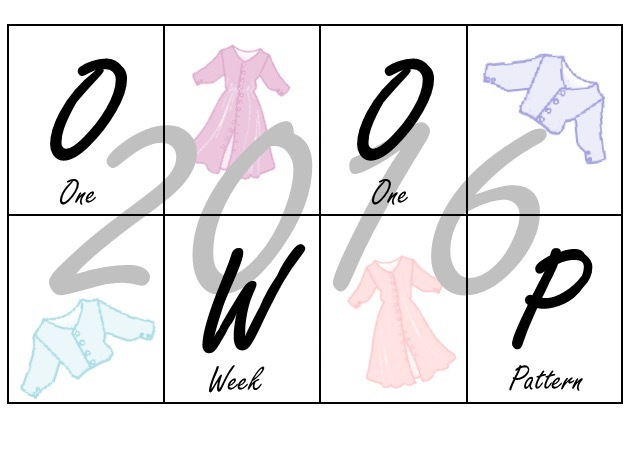 I saw the pattern in Sew Today, one of my main sources of real – life inspiration. I’m not sure why I bought it, as my underwear drawer is over-flowing, partly thanks to the pre-Christmas enthusiasm for knicker making. But these will be more comfortable on the middle aged body….. I also think that I wanted to do something a bit out of my normal comfort zone, possible driven on by the Sewing Bee challenges. Although they haven’t ventured into underwear ( an idea for the next series perhaps!) I might eventually make the slip as a summer nightie, as my summer nightwear does actually need to be replaced. But then again, I might not! I bought the material the Sewing Show at the NEC. It’s about the right weight and the right amount of stretch. I thought that colour combination would be easy to work with, but I have since noticed that it is mock snake skin, which isn’t really my style. First issue: the cutting layout is such that it was better to create a whole new set of full width pattern pieces rather than to cut each piece on folded cloth. I then cut it out as a single layer of fabric. So above you can see the fabric, the pattern and one of the extended pattern pieces. Next issue: sourcing the ‘notions’, as patterns used to call them. I rely on a couple of stalls on the market for lace and similar trimmings, but found it difficult to source stretch lace. If am to be more adventurous in this area of garment making, then I need to find a reliably good source. So out came another sewing magazine, any one of which has a range of adverts for web suppliers, which, I have to say, are sometimes more interesting and have longer term use than the designs themselves. For the bra strap fittings: minervacrafts.com, which looks to be an excellent web site which may replace the market as my main source of general sewing supplies, mainly because I can shop at any time of any day, and not just Saturday mornings. Now I am waiting for my supplies to arrive. Which they duly did, albeit I had mis-read 14cm to be 1.4 cm in one case, and the lace is far too wide. My mistake, so now I am looking for ideas for using 14cm wide lace. And, right now, I haven’t had any! 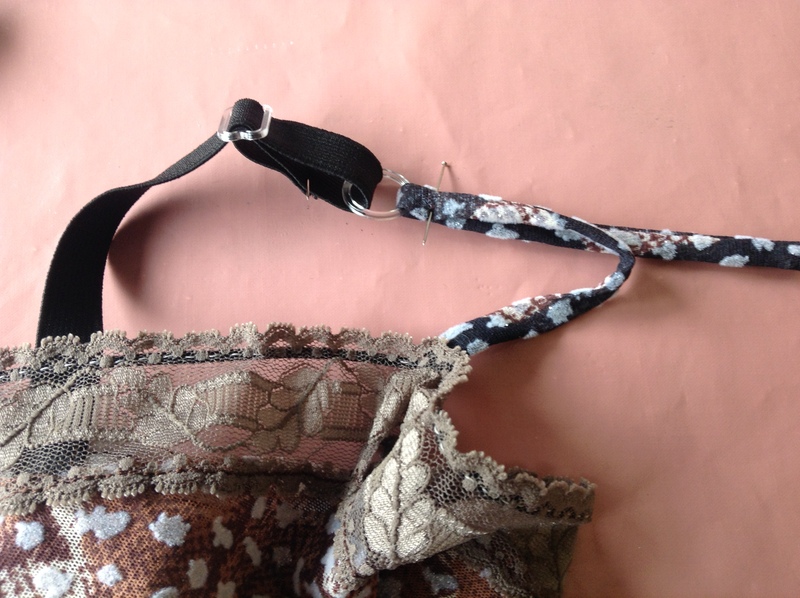 I cannot find any suitable 1.3cm lace for the straps, so I have made my own straps from the fabric itself. That’s twice I have used my new loop turning gadget in the last week. How did I ever manage without it! Start with the knickers, as I have made knickers before and have a generally good idea what to do. Apart from the fact that occasionally the machine foot does not catch hold of stretch material properly at the start of sewing and I have to deal with the mess and start again, all went well, as demonstrated below. They fit quite well. 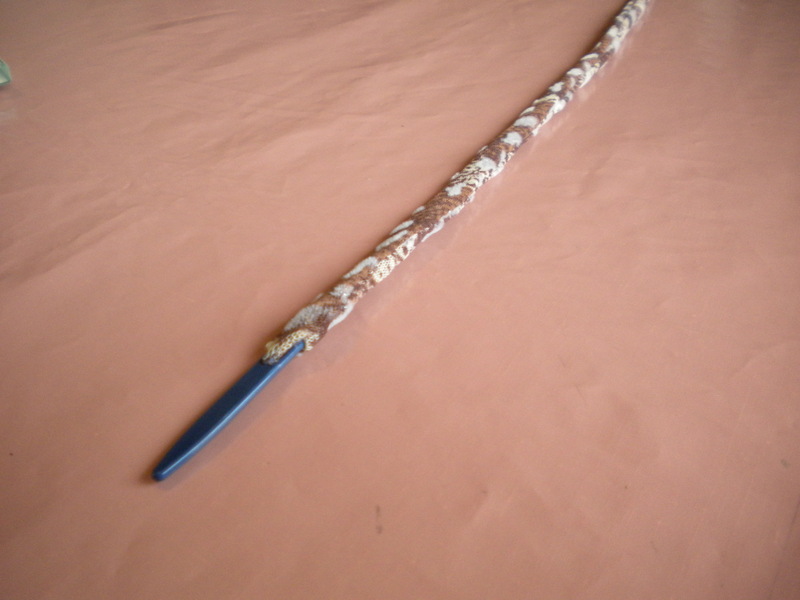 I am quite pleased and will live with the mock snake skin! And so on to the vest. There are several parts of the vest construction that I rather feared. 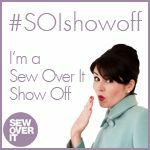 First, when cutting out from a single layer, make sure that you have turned the bra section over and have cut opposite facing sections. I’ve got plenty of material. That is easily put right! 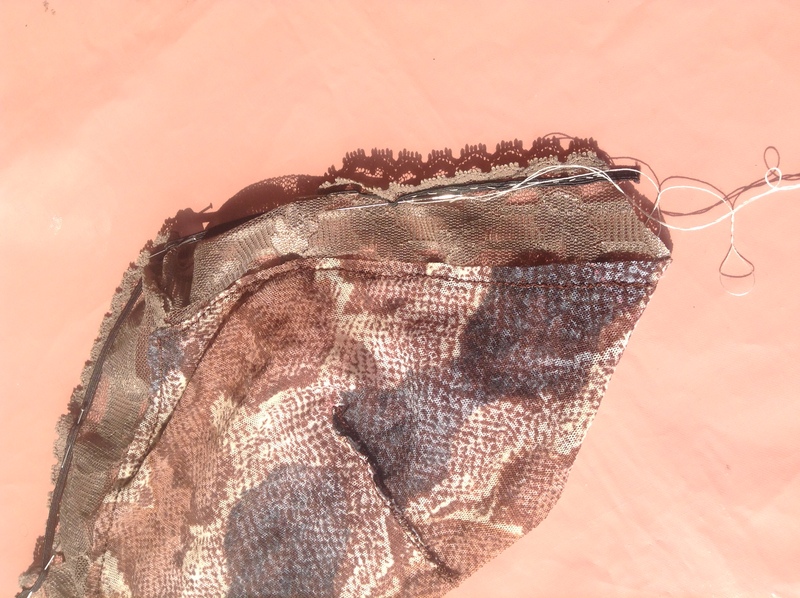 With stretch stitch, it’s not too difficult to attach the lace to the fabric, luckily, and the instructions are good for getting everything lined up properly. Here I am making sure that the two bra sections line up and that I a pinning on the lace such that it folds the same way at its highest point. Next stage – attach 3mm wide elastic 6mm from the top of the lace. I practiced. And failed! I thought that a small zig zag would do the job but anything slightly too near to the lace edge wrapped the top of the lace. Then I just tried a straight stretch stitch, but the foot and feed dog didn’t like it at all. Far too delicate. I stopped quickly. I ended up hand stitching this, stretching everything whilst I did so. So the next challenge was to see if the fabric straps can substitute for lace, and to work out the lingerie strap fittings. I had rather hoped that the multiple pattern diagrams would prove this to be straightforward, but test before you sew….. not only was the method right, but the tension over the shoulders wasn’t far off either. I didn’t cut the front part of the strap to length until I was happy with the tension. And finally the home run; add lace to the bottom. Result above! 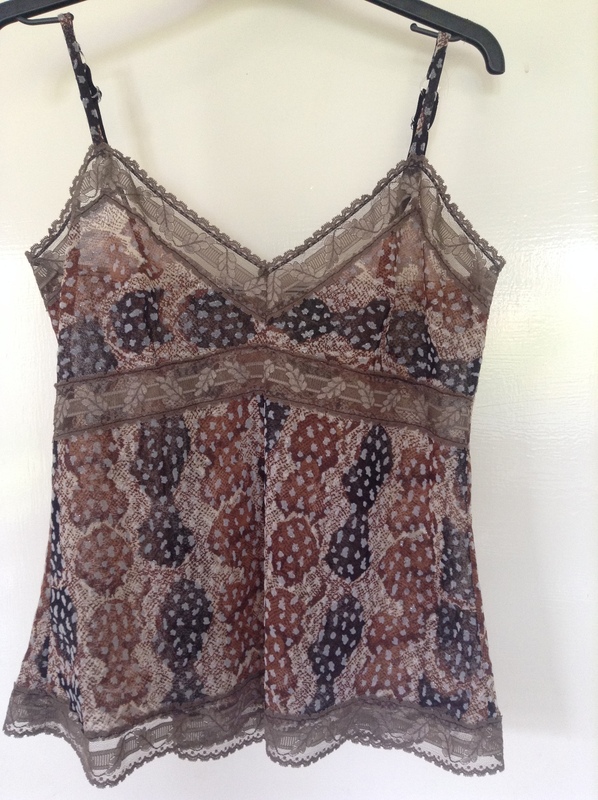 Will I be using the pattern for a summer nightie? Probably not. But I seem to have quite a lot of lace left (never mind the 14cm wide stuff! 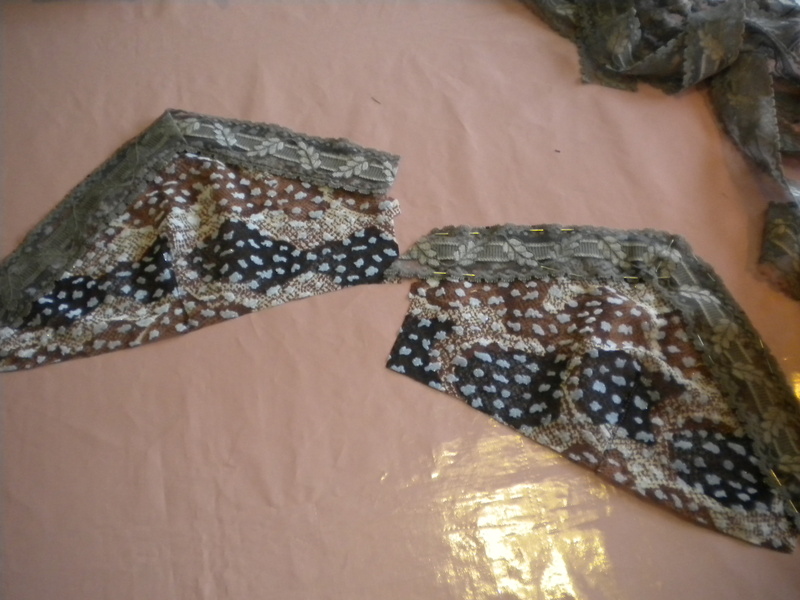 ), so I may need to make more knickers. And another question. Why have I booked on a course about using stretch fabric when I can make things like this? 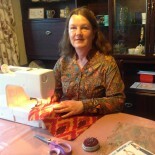 This entry was posted on April 9, 2014 by ann hebden in Fashion, Sewing.